Well well well, if it isn’t 2014. I haven’t dumped photos for quite some time, so here are some things that I saw in the tail end of 2013. 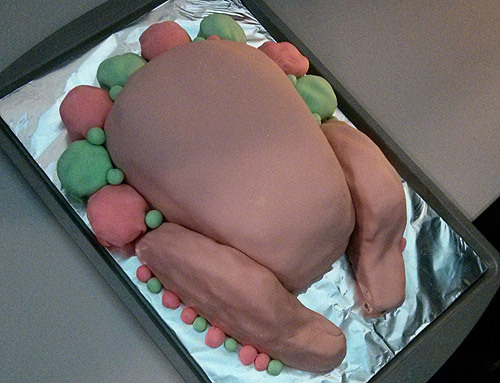 My cube neighbor at work has a late November birthday, and 2013 was one of the years where that birthday fell on Thanksgiving day. So I tried my hand at making a cake with marshmallow fondant. I’d made it once before, but several years ago. (Overall, I judge it as pretty easy, but really time-consuming. And really delicious.) I was going to make the turkey golden-brown cooked color, but as I added the food coloring bit by bit, I came out with this flesh-tone before I got to brown, and figured I’d stick with it. Because it has more … character. Scott had some plantar warts. The podiatrist put acid on them, repeatedly. The entire affair was fascinating. The best part was when he’d go in two weeks after the acid treatment, and they’d carve away all of the dead skin, then sand him down with a Dremel tool. To celebrate the final acid treatment (which happened a few weeks ago), we’re going for pedicures. I will try to convince him to go for nail polish, but I will most likely fail. 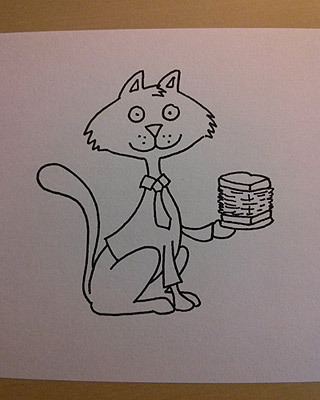 My little Holiday Doodles continue to be a delightful project. My phone is chock full of pictures of the drawings, because it’s easier to take pictures than to try to use our printer/scanner. Half the time, it won’t connect wirelessly. Then half of the time it does connect, the scanner doesn’t want to work. I don’t know if we’ve EVER had a printer that’s worked seamlessly; for some reason, they’re always twitchy and buggy for us. The Doodles also premiered on GoComics this last month, which is totally awesome. I’m tickled to be a part of the same family as Dilbert, Garfield, and Basic Instructions. I’ve also been dabbling into other artsy projects. 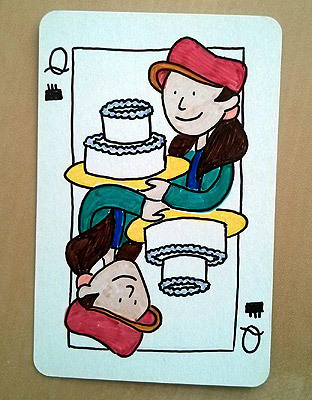 I got a box of blank playing cards, and a package of fine-point Sharpies; here’s the “Queen of Cakes” card I made for my friend Jen. I’ve started playing a little game, in which I give backstories to people with personalized license plates. 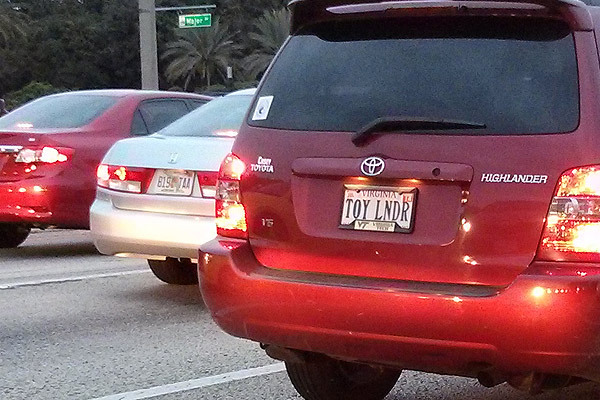 For example, here’s TOY LNDR. Lots of options when you throw in vowels, but I think he’s a Toy Lender. He owns a small company that will rent you whatever toy you desire, rare or common, from Tickle Me Elmo to Tomagotchi to the Barbie Dream House, so for an hour or two you can enjoy a return to your childhood. Yesterday on my way to work, I was behind WAGG1R1 for a short while. It felt like she probably meant “Wag Girl”, and is probably just a huge fan of dogs. I, however, took the double use of the number 1s to both be analogues for the letter I. She is, then, The Great Waggiri, a world-famous magician with a dog-specific act. Scott would like me to point out here that HE’S THERE, NAPPING. One Scott, no waiting. Curl right up. And yet they’re both waiting for me. Poor guy. Last but not least, I love where I work. 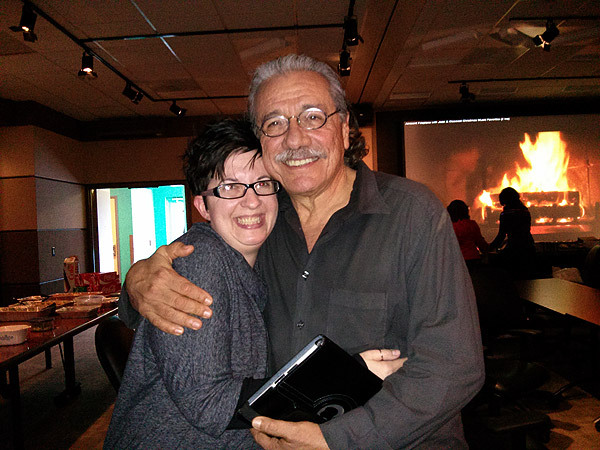 It’s not every workplace where Edward James Olmos (who I’m convinced is one of the nicest guys on the planet) stops by your office holiday potluck. GREAT update! And you, Scott, and the cats ALL look so great! Despite the loss of Commie, 2013 must have been a pretty good year for the Meyer household. Onward! Happy New Year! 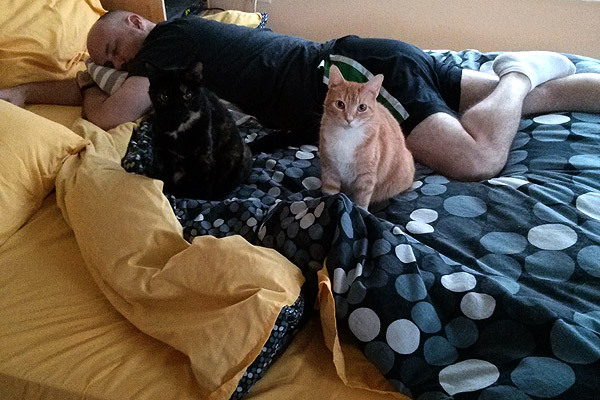 Love the photodump; a post introducing Cheddar would be great! Or, he just wanted you to be sure to know that he’s driving a TOYota highLaNDeR. I don’t know when I’ll get back to this blog. I just don’t feel like I have all that much to say over here anymore. I have thought about revamping the format somewhat, but I’m not sure what that would be. And yeah, it’s probably because I have to post daily over at the Holiday Doodles, and I figure that’s about all the time I want to put into blogging of any kind. I have a couple of other projects in the works as well, so this place falls to the bottom of the priorities list. ‘k – well, I figured you might not be aware that some of us enjoy your personal pics as much as your doodles, and your “voice” in the writing brings us back for more. Wish I could have found time to bring my hubby to Disney while we were in Florida last month, on the “off” chance of running into you and/or Scott! (I’m such a fangirl) But alas, it didn’t happen. Have you made it to your WP TJ’s yet? My father’s in Sorrento, and he’s waiting for the crowds to thin.